PSI's air motors produce rotational power developed at an output shaft when compressed air is supplied to an inlet port. The objective of an air motor is to produce enough power to overcome a specified torque level and operate at a desired rpm range. The amount of torque a PSI motor can produce is determined by its integrated gearing. 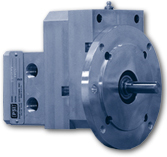 PSI uses heavy duty spur gears for simplicity, but offers planetary gearing on some models. Variable rpm and power is attained by simply throttling inlet air. PSI air motor models are designed to run slower with higher torque loads, and faster with lower torque loads. This characteristic is a major advantage in many applications. Matching the motor's speed range with its available torque allows for consistently reliable high starting and running efficiencies. One important note on model selection should be considered by the purchaser - model selection should be based upon 2/3 of the available supply pressure, or less, as determined for each application. All PSI air motors listed in this catalog can be driven by compressed air or nitrogen. They are lubricated by an oil mist in the inlet piping for smooth operation of the motor's vanes, rotor, and cylinder. DVAR through DV4 model integrated gear boxes are lubricated by greases as compared to DV6 through DV62 which use an oil bath. Exhaust noise should be reduced by the installation of air line silencers.